Nebraska ranks second in the nation in total cow-calf production, only behind Texas. However, when late spring and early summer roll around, most farmers and ranchers have just one thing on their minds – planting and irrigating crops. 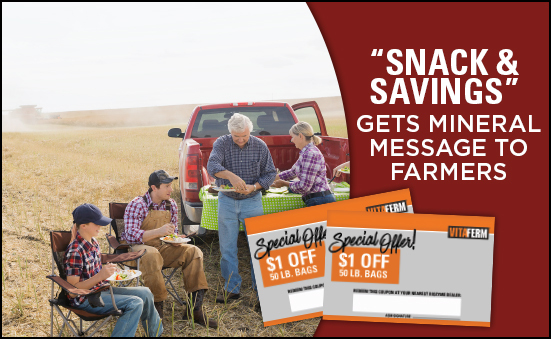 Taylor Ruether, Area Sales Manager for Nebraska, was working with a few of her dealers to come up with an innovative way to get in front of farmers during their busy season, when the “Snack & Savings” approach was created. “One dealership gave me the idea to do this, because I was wanting to work with him, and he kept saying, ‘It’s farming season, you can’t catch any body right now.’ So, I was trying to come up with a way to get in front of farmers during their busy season,” Ruether said. Snack & Savings gave Ruether and her dealers the opportunity to get in front of farmers – bringing them either a sack lunch that included a sandwich, chips and a drink, or a mid-afternoon snack of a cold-drink and either a bag of chips or a candy bar. Included with the snack was a product guide and a coupon for any VitaFerm® product. Ruether made this opportunity available to any of her dealers who wanted to set up appointments to meet with customers and potential customers. She had a couple of dealers who really grasped the concept and spent a couple of days with a cooler of water and sodas and met with farmers to remind them about summer mineral programs. “We felt like it was a good way to give back to farmers when they are crazy and hectic, and it did get most of them to stop and talk to us, even if it was just to remind them about BioZyme. No one usually turns down a pop and a bag of chips. The beautiful thing about this promotion is, if someone didn’t use the coupon, it didn’t really cost anything,” she said. The Snack & Savings trips were a good investment in time. 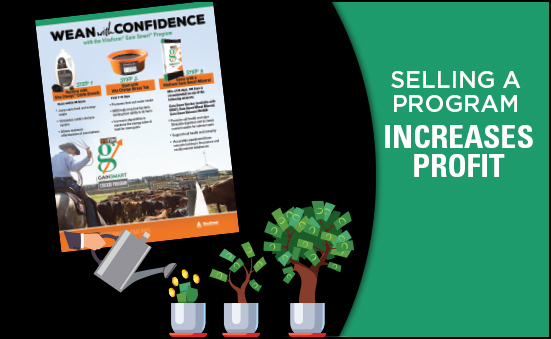 Ruether said that dealers did make some Sure Champ® Extreme and VitaFerm® HEAT® sales while talking to the famers. Follow-up appointments have resulted in interest in the VitaFerm® Gain Smart® program. Ruether will work with her dealers again on similar promotions and marketing efforts, taking the message to the customers. She feels the efforts are worthwhile and she will encourage more dealer involvement. She also learned that chips are the preferred snack over candy bars. “Anytime you do stuff like this, the more people expect it, and the better response you have. We’ve had some follow-up, and that was worth our time and effort,” she said. It is very apparent that organic reach for Facebook posts has been taking a hit over the past few years. Even as recent as this year, with Facebook limiting the reach of “promotional posts,” the percentage of followers a company reaches organically continues to decrease. While it is possible to slightly improve this percentage through higher quality content, Facebook advertising offers more effective ways to improve post viability, for a price of course. Facebook advertising allows companies to choose a post and have it distributed in the news feed to anyone they want, based on interests, demographics, etc. It’s easy to boost a post. It’s hard to effectively boost one. The key lies in who you are targeting. 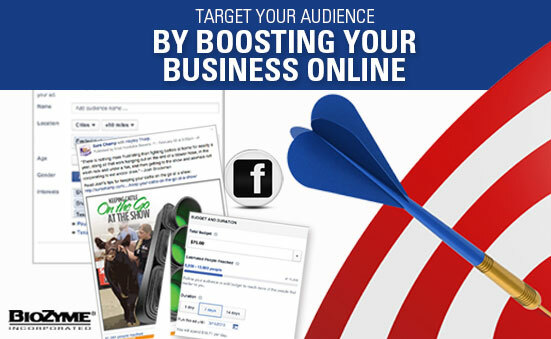 Based on the goal, you have the ability to target anyone you want on Facebook. When boosting a post, Facebook offers specific targeting options including: audience (fans and/or friends of fans), location, age, gender and interests. If the post is focused on information only relevant to current fans, it’s important to target only those people. On the other hand, if the goal is to interact with potential new customers, that needs to be reflected in the targeting. There is no way to stress enough the importance of having a high quality image or video tied to a post. When boosting a post, especially to users who might not be familiar with the brand, the image will be the first piece they see. It needs to be eye catching and engaging at the same time. If using an image, make sure it is appropriately sized. If these dimensions are not followed, Facebook will resize them, causing images to look less attractive. An image 1200px by 900px is a safe bet. You can find ideal image sizes for all the Facebook Advertising campaigns at: https://www.facebook.com/business/ads-guide/post-engagement/photo. It is important that all images are high quality to avoid blurry and distorted messages. Most importantly, if you plan to pay for a boosted post, you must follow the 20% text rule. While organic posts do not need to follow the 20% text rule (only 20% of an image can include text), boosted posts do. Facebook offers a variety of different advertising options. While they make it easy to boost a post and move on, it’s important to know what options they have and see if there is one better suited for the target audience and goals. Visit www.facebook.com/business/ads-guide for a breakdown off all the different advertising options. While boosting a post may seem as simple as pressing a button, there is a lot more to consider in order to effectively use it and see results. To avoid irrelevant clicks and visitors, advertisers need to understand who they are targeting, what the goals are, and why users should care about the post. Your iPhone can be a powerful tool for business – or a complete distraction. The key to any software program or app is finding the right match for your specific needs or deficiencies and then committing to using the tool so you can take advantage of the benefits. 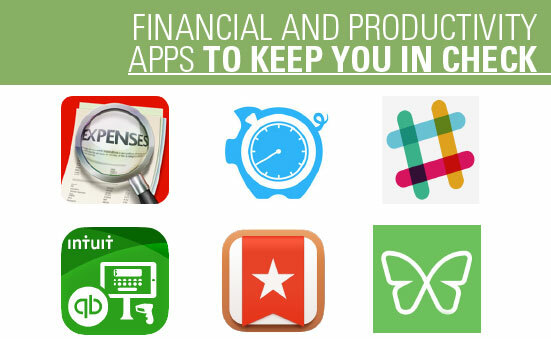 The following are a few apps that may be able to enhance record keeping systems, automatically sync income or expense data with your financial software, increase communication and transparency with your team and boost productivity. An all-inclusive expense tracking and reporting application for dealers wishing to track their expenses and mileage. It’s power does not end at the iPhone but extends to the desktop by allowing emailing or exporting of the expense files and accompanying photo receipts directly to the desktop. Quickly snap shots of receipts for easy scans and financial tracking. Track your mileage in real time by using your device’s integrated GPS. Export your records in .PDF and .CSV file formats. Need a way to track your time or an effective tool for employees to use so they can send you time reports? Clock in and out as you work. Or, add entries yourself in just a few quick taps. Time entries are automatically created when you clock out. Easily review your past entries, grouped by day, week, month or pay period. You can easily export your data by job, date or selection. Choose to export as a text summary or in spreadsheet-ready CSV format. All your team communication in one place. Slack is a new way to get more done, spend less time in meetings and reduce email. Real-time messaging and file sharing for one-to-one and group conversations. Proven to make your working life simpler, more pleasant, and more productive. GET PAID QUICKLY … ANYWHERE, ANYTIME. Plug the card reader into your iPhone or iPad and swipe credit cards quickly and securely. Or, if you don’t have a card reader, you can always scan a card with your camera or key in the card details directly. Your customer signs right on your device to authorize the payment. Then, you can email or text a receipt to your customer. Accepting a payment takes just a few taps from start to finish. Wunderlist allows dealers to access their to-do lists from almost anywhere. Star important tasks, create multiple lists, sort by due date and priority and add tasks via e-mail. Since multiple parties can edit lists, the app doubles up as a collaboration tool that works across desktop and mobile. With so many distractions and possibilities in your digital life, it’s easy to get scattered. Freedom blocks digital distractions so you can be more productive. Start a Freedom session, and you’re blocked from all distractions on your phone or tablet. Freedom gives you peace and quiet, so you can accomplish more. Technology has come a long way. It’s great when it works, but more importantly, to work it must be easy. Retail outlets have used promotions and customer loyalty programs for ages to drive sales and repeat business, but often these programs are difficult to manage for both the store staff and the customer. However, there is an innovative program available that automates the management of rewards points and makes communicating with your customers easy! Buy 10 bags of Sure Champ® and earn a show stick, pig whip or brush. For every 10th visit to the store where you purchase $50 or more, earn a free gift. Come in on your birthday and receive $10 off your purchase. Earn double loyalty points on Tuesdays. These types of incentives are appealing to those customers who enjoy a bonus, and if done strategically, can be an effective way to ramp up business on specific days that may normally be slow or to promote slower moving products. 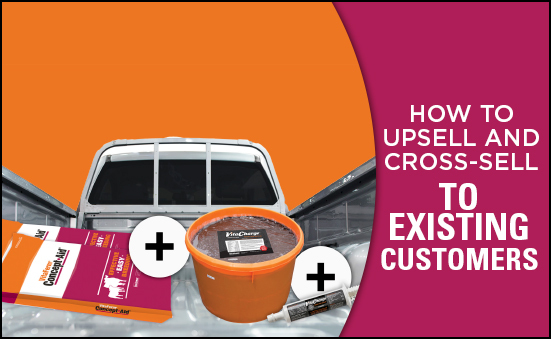 Additionally, it’s a great way to stay in front of your clients and market in a fun way. OptSpot (www.optspot.com) combines customer loyalty and text message marketing to increase customer frequency, connect with customers and drive instant revenue. Customers simply sign-up & check-in using their mobile phone number. Points are automatically tracked & rewards are earned based on points. Re-connection is automated and done through text messaging. 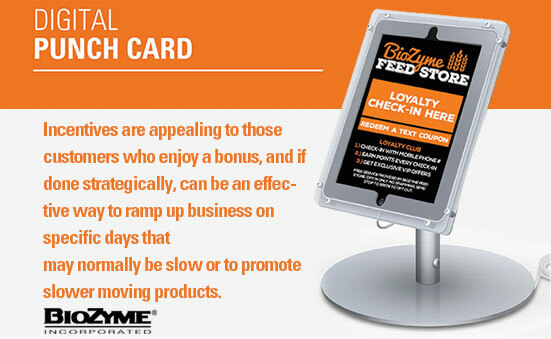 Customer Loyalty: Using a mobile number to track points and rewards is easy. Customers either enter their number into the tablet or you do it on your point of sale checkout system for them. Points are tracked and rewards are earned automatically. Auto-Engage: Reconnecting with your customers automatically based on frequency is nearly impossible without innovative solutions. This text program will send a text message to those customers who have not visited in 30, 60 or 90 days inviting them back more often. Text Message Blasts: Being able to get your message in your customer’s pockets can drive instant revenue. Send limited time offers, promotions, etc. and watch your business grow. customer relationship management (CRM) software through an automated text call to action.